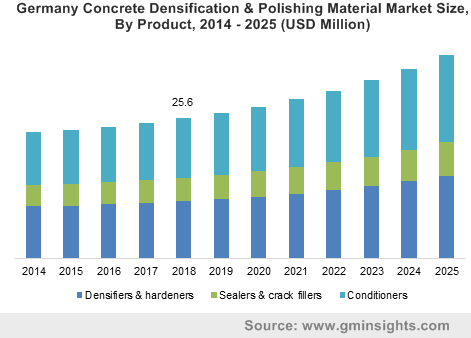 Concrete Densification & Polishing Material Market Size was estimated over USD 300 million in 2018 and the industry will grow by a CAGR more than 5.5% up to 2025. Concrete Densification & Polishing Equipment Market Size was estimated over USD 1.5 billion in 2018 and is projected to observe growth more than 3.0% over the estimated timeframe. Proliferation in construction activities in BRICS nations in the past years is analyzed to be a key propelling factor for entire concrete densification & polishing material & equipment market size. Over the past decade, BRICS nations have contributed to more than 50% of the global growth. Currently, the economic aggregate of these countries account for around 23% of the world's total. Infrastructure projects made a very big contribution to this achievement and these countries are using domestic reforms to trigger a new round of economic growth. BRICS consists of developing countries and all of which have faced the problem of slowing economic growth post-2014. For its part, China is undergoing an economic transformation as it pursues supply-side structural reforms, Brazil is promoting privatization, whereas India has also taken steps through structural reforms in its policies to attract FDI. This results in improvement of the ease-of-doing-business index in these countries. Around 36% of the global population is concentrated in China and India. With such a huge population, the demand for homes, buildings, and infrastructure is significantly high. The global population is anticipated to increase by more than 1 billion in next 13 years, and 11.2 billion by the end of this century. This will be accompanied by rapid urbanization and these factors clearly indicate that the need for proper infrastructure and buildings for the urban population in the developing nations will increase in future. Currently, most of the industrial and commercial building constructors choose concrete flooring as one of the best option due to less maintenance, ease of cleaning, resistant to stains & damages and other features. This in turn, will lead to a substantial growth in concrete densification & polishing materials & equipment demand by 2025. Concrete densification & polishing material market is divided into three key products which include densifiers & hardeners, sealers & crack fillers, and conditioners. Sealers & crack fillers segment was valued at more than USD 45 million in 2018 and will likely expand its share in coming years. This is all due to the extensive usage of the product on the rough, cracked and damaged surfaces. The product is mostly employed for densification process of concrete floors as they helps to prevent the moisture, water, oil, etc from getting into the surface, and also improves the appearance of the floor. Conditioners held more the 35% of the overall revenue share in 2018 and will show the positive growth rate in future due to its compulsory usage at the time of concrete floor polishing process. Surge in demand for lustrous, decorative and eye-appealing floors in most of the end-use sector will strengthen the entire market penetration in forecast spell. 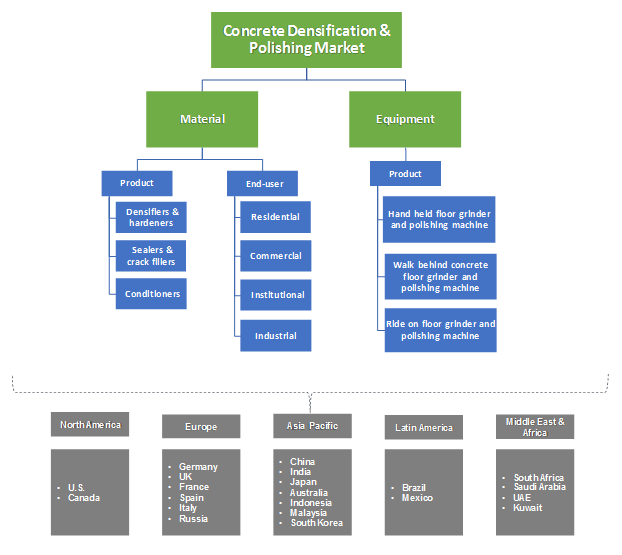 Concrete densification & polishing material market is bifurcated into four major end-use sectors include residential, commercial, institutional and industrial. Among these sectors, residential and commercial buildings collectively held more than 45% of the volume share in 2018. The product is widely used for densification & polishing the surfaces as they add strength to existing floors, protects the surface from deterioration and heavy loads, and also resist the oil and water penetration. Institutional end-use sector includes schools, colleges, universities, etc. and the segment was valued over USD 60 million in 2018. The segment will grow at a substantial rate in future due to the increase in construction of institutional buildings in most of the developing economies. The above mentioned factors will subsequently boost the entire concrete densification and polishing material market demand by 2025. Concrete densification & polishing equipment market is segmented on the basis of product which include hand held, walk behind, and ride on floor grinders and polishing machine. Among these, walk behind grinders & polishing machines accounted for more than 55% of the overall equipment market share in 2018 and is likely to bolster in coming years. The equipment is widely known for its efficiency and easy mechanism. These kind of machines are available in various sizes and are employed to grind and polish the concrete floors of commercial & residential buildings, retail stores, warehouses, etc. Positive growth in residential building construction activities across developing economies will certainly stimulate the concrete densification & polishing equipment market in future. North America was one of the key contributors to the concrete densification & polishing market and accounted for over 30% of the overall market volume in 2018. Surge in remodeling and renovation practices across the region, especially in residential construction sector, will positively propel the regional product demand in future. Prevalence of mature industrial sector such as automotive, food & beverage, pharmaceutical, etc. will further boost concrete densification & polishing material & equipment demand for regional flooring applications. Asia Pacific is anticipated to experience a substantial gain of over 7% CAGR by 2025. Escalating construction sector in Japan, China, and India is analyzed to be a crucial factor propelling the regional concrete densification & polishing material & equipment market share over the forecast period. Additionally, surge in manufacturing facilities set up in Asia Pacific owing to the government investment for upscaling of manufacturing businesses will complement concrete densification & polishing material & equipment demand by 2025. The Euclid Chemical Company, Flowcrete Group Ltd., W.R. Meadows Inc, Canzac, LATICRETE International, Inc, Markham Global Ltd., Concrete Earth and BLENDER GROUP S.A. DE C.V. are the major players in concrete densification & polishing material market. Husqvarna AB, The Werkmaster, Bosch, Hilti, KLINDEX, Changsha Honway Machinery Co.,Ltd, Diamatic, TYROLIT, LINAX co.,ltd, and SASE Company, LLC are some prominent manufacturers of concrete densification & polishing equipment. Concrete densification & polishing material & equipment are widely used across residential, commercial, industrial and institutional building construction. The product offers resistance against abrasions, high impact, from harsh climatic conditions, etc. Thus, surge in infrastructure spending around the globe will positively influence the flooring demand, thereby enhancing the market size in coming years. Moreover, the ongoing infrastructural development activities across North America and Asia Pacific will further bolster the entire market growth by 2025.